Homecare oxygen concentrators market size was valued over USD 835 million in 2017 and is expected to witness growth of around 10.5% CAGR from 2018 to 2024. Increasing prevalence of chronic respiratory disorders such as bronchitis, asthma and COPD have influenced the homecare oxygen concentrators market growth significantly. In 2015, in U.S., there were around 3.17 million deaths due to COPD. It is the fourth leading cause of death in the United States and thus, has increased the demand for home oxygen therapies. Furthermore, development of certain healthcare policies by health insurance companies in the U.S. such as Medicare and Medicaid have resolved the affordability issues faced by the geriatric population that is more susceptible to respiratory infections propelling the homecare oxygen concentrators market growth. Also, increased preference of homecare oxygen concentrators by American geriatric population while travelling will drive the industry growth during the forecast period. Portable oxygen concentrators segment dominated industry with the market value of around USD 646 million in 2017. High market share of portable oxygen concentrators is attributed to the ease and convenience offered by these portable oxygen concentrators. Portable oxygen concentrators are mostly preferred by the geriatric population that suffers from chronic respiratory disorders. During the forecast period, ease and convenience offered by portable concentrators will augment demand. Compressed gas oxygen cylinders segment is forecast to witness robust growth of over 10% over the forecast period owing to the advantages and benefits offered by these cylinders. Also, compressed gas oxygen cylinders are relatively cheaper than the liquid oxygen and hence are highly preferred. U.S. dominated the North American homecare oxygen concentrators market in 2017 and is estimated to grow with a CAGR of 9.6% during the projection period. High growth rate of oxygen concentrators used for home therapy is attributed to the expanding geriatric population pool suffering from chronic diseases. Furthermore, escalating prevalence of COPD and bronchitis will drive the demand for home oxygen therapy. Portable home oxygen concentrators are more efficient with a long battery life have impacted the industry growth positively. Germany homecare oxygen concentrators market accounted for USD 37.9 million in 2017 owing to high technology adoption rates that aids improvisations in the oxygen concentrators. Increasing healthcare expenditures have initiated modifications in the existing home oxygen concentrators which will surge industry growth during forecast timeframe. 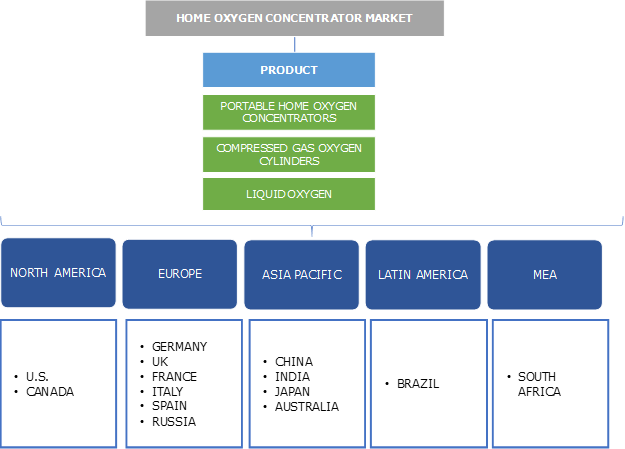 Some of the notable players operating in homecare oxygen concentrators market are Precision Medical, Inc, Besco Medical Co, Air Water Inc., Yuwell, Longifian Scitech Co, BOC Healthcare, Chart Industries, Drive DeVilbiss Healthcare Inc., Inogen Inc, Inova Labs, Invacare Corporation, NIDEK Medical Product, Inc, O2 Concepts, Philips Healthcare, Teijin Limited. The key industry players have been focusing their efforts on research and development to maintain their market position. In January 2018, Philips developed light weight Everflo oxygen concentrator which is preferred mostly by the geriatric population at home for long terms oxygen therapy. Developing such oxygen concentrators integrated with advanced technology will enhance the product portfolio and render revenue for the company. Growing geriatric population suffering from chronic diseases such as diabetes, cancer, COPD and other respiratory infections have impelled the industry growth globally. In addition to this, continuous requirement of long term home oxygen therapy to reduce the stress levels in individuals suffering from stress related disorders such as high blood pressure and other minor cardiac ailments have driven the market growth considerably. Moreover, major industry players that are involved in manufacturing of oxygen concentrators have maintained the quality of oxygen concentrators for home use. The overall market is oligopolistic in nature with a few dominant players dominating the market and supplying superior quality home oxygen concentrators that have driven the industry growth.